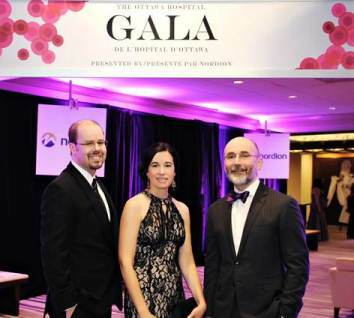 Ottawa’s glitterati, including community and businesses leaders, joined local researchers in honouring their peers at The Ottawa Hospital Gala presented by Nordion. In particular, three researchers were feted for their groundbreaking work and innovative accomplishments. Dr. Marc Carrier will receive the Chrétien Researcher of the Year Award for leading a clinical trial, which will save countless patients with blood clots from unnecessary and potentially harmful tests. Dr. David Moher will receive the Grimes Research Career Achievement Award for his pioneering work in combining the results of many different studies to solve medical controversies, and for creating guidelines to improve health research reporting. Dr. Carolina Ilkow will receive the Worton Researcher in Training Award for her outstanding work in developing cancer-fighting viruses with Dr. John Bell, including a novel virus targeted against pancreatic cancer. The Ottawa Hospital Gala also serves as a fundraising event for research right here in our community. Thanks to sponsors like Nordion and the many corporations who hosted tables for this evening of celebration, more than $410,000 was raised through this event. In the past year, the Ottawa community has donated more than $26 million in support of groundbreaking research at The Ottawa Hospital. While the event acknowledged and highlighted the research winners, The Ottawa Hospital Foundation took a moment to unveil leaders who will work to inspire the community to support its Tender Loving Research Campaign during the course of the next two years. The Right Honourable Jean Chrétien will serve as Honourary Chair; while Greg Kane, Queen’s Counsel at Dentons Canada LLP - who also happens to be the co-chair of the Gala and former chair of the Foundation’s Board of Directors – was appointed as Chair of the campaign. Also on hand for the announcements was CBC news anchor Lucy van Oldenbarneveld who is the first Patient Ambassador for the Tender Loving Research Campaign which has a $50 million goal to fund made-in-Ottawa solutions for a healthier world.